Product prices and availability are accurate as of 2019-04-11 04:42:13 EDT and are subject to change. Any price and availability information displayed on http://www.amazon.com/ at the time of purchase will apply to the purchase of this product. A good set at a value price. The outside spurs of this Woodtek seven piece bradpoint drill bit set cut chip-free holes and keep the bit on track in twisted grain: Includes 1/8", 3/16", 1/4", 5/16", 3/8", 7/16" and 1/2" bits, 2-3/4" to 6" long. Bits over 3/8" diameter have shanks turned down to 3/8". 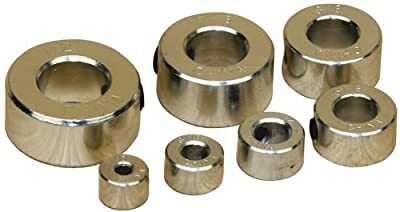 Add the 202-220 7-pc stop collar set for precise depth control. Individual 7/8" diameter bits with 3/8" reduced shank are Limited to Quantity on Hand Imported.